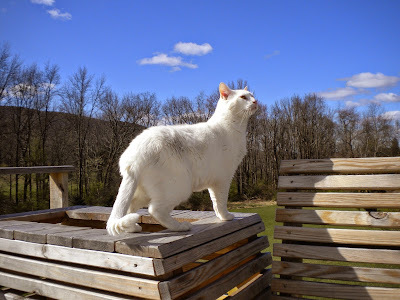 I have a very special Authors and Cats post for you this month. Several months back, I was contacted by an author to feature one of his books at my historical fiction site, Historical Fiction Connection. In the process of our correspondence, he mentioned my being a cat person and told me that he has four rescue cats. One of them, named Django, was abandoned by his mother at four weeks and rescued just as a red-tailed hawk was about to carry him off for dinner. 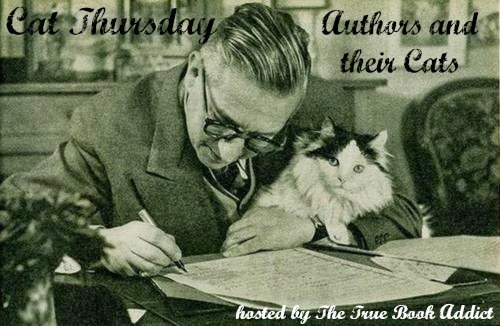 Of course, I always love talking to fellow cat people and I asked him if I could feature him on a Authors and Cats Cat Thursday. Of course, he agreed! 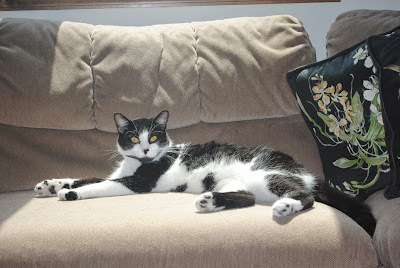 He wrote something up about his cat rescue story and sent along pics of his little darlings. And so, introducing Shaun Mullen and his cats! I have been compared to novelist Ernest Hemingway by more than a few people because of my writing style — spare but rich prose — and my visage — full beard and bald head. But there is a third similarity: A mutual love of rescue cats. The first of many rescues that I, and later my love and I, have had over the years was Terrapin, a six-week-old-or-so descendent of cats at the Ernest Hemingway House in Key West. Papa, as Hemingway was called by family and friends, had included a provision in his will that the cats living on the grounds of the big house on Whitehead Street were to be cared for in perpetuity. He had said nothing about their not being adopted. Terrapin, a slightly cross-eyed ball of black and white fluff, was polydactyl as a result of interbreeding. He had six toes on one front paw, five on the other and the usual four on each of his back paws. Fast forward 40 years to our mountain retreat and our four current rescues, all males as it turns out, who share our house and mountainside grounds with brother-sister chocolate Labradors, who also are rescues. Everyone gets along just fine. 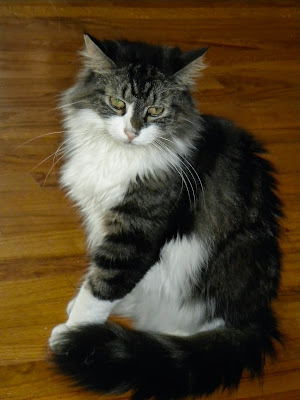 The oldest of the cats at age 13 is Kimba. While he is a hunk and a half in the looks department and has one blue and one green eye, he is a few whiskers short of a full meow probably owing to his having been malnourished in utero and his feral existence as a kitty. He’s great at climbing up trees but hopeless when it comes to getting back down. Next comes Iggie, who as a kitten was found cowering next to a religious statue in a friend’s yard. Now age 6, Iggie is one of the two most intelligent cats we’ve ever known. Slightly cross-eyed, he spends hours staring at the ceiling; it was only recently that we deduced that he wasn’t spacing out but working on Foucault’s Last Theorem. Mr. Taj had been abandoned at age 2, or so, and somehow had survived most of a brutally cold winter when we lured him into a Havahart trap. Now age 5, it has taken him years to build up trust in people. 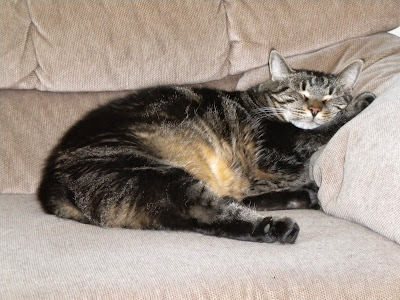 He is built like a linebacker, but has the most delicate meow, is deceptively quick and an excellent mouser. Django will turn 2 this summer. He had been abandoned by his mother and at age 5 weeks or so, had lost about a third of his tail and was hawk bait; indeed, the day we trapped him in a briefcase there were two red-tails circling overhead. He is a great leaper and easily clears two sleeping dogs from a standing start. We we have a tried-and-true way to avoid many of the hassles of acclimating a (terrified) new rescue cat. We put a newbie in our downstairs powder room with a screen door to keep it in, or alternately a big dog cage with little Django. They stay under house arrest for as long as necessary — about a month on average — and during that time become accustomed to the sights, sounds and smells of the house and have plenty of quality sniffing (and hissing) time in getting used to the other critters. When they’re ready to be released, they fit right in. 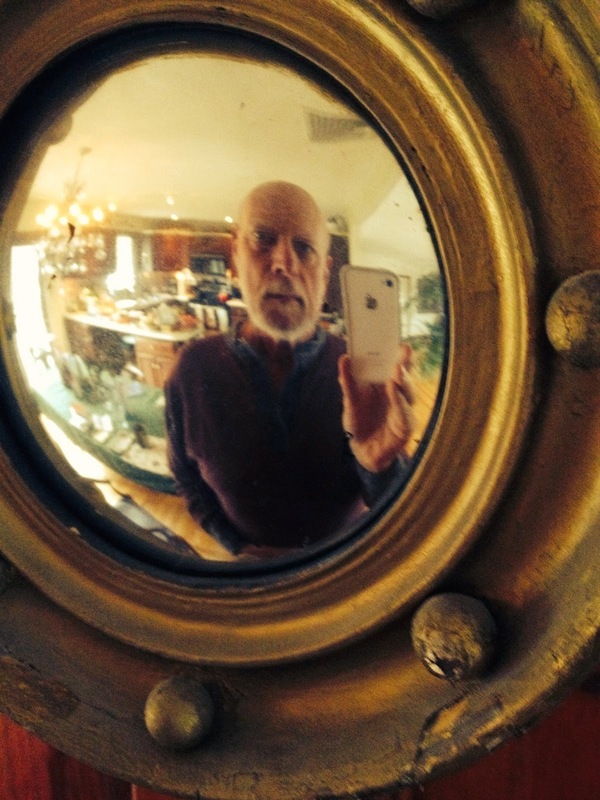 As a career journalist of the old school, I had long resisted writing about my own life on a farm beyond the far western suburbs of Philadelphia in the 1970s, but people kept telling me that those years on the farm would make for a very special book. They were right. 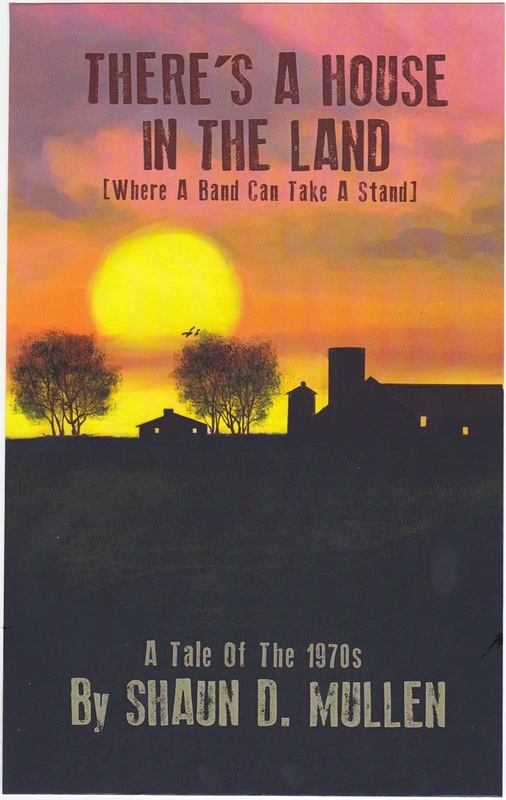 “There’s A House In The Land (Where A Band Can Take A Stand)” fell into place when I decided to write about the farm from an historical fiction perspective. Writing about my decade on the farm through the lens of historic fiction let me do a couple of things: A few of my housemates had not survived the decade, but most were alive and I wanted to protect their identities, so names of people and places were changed. And I rearranged some events from their sometime chronological inconvenience to my writerly convenience to give the book a better and more dramatic flow. Another problem remained. Our adventures aside, there was a profundity to our time together, the lessons we took away and how they have shaped our lives since. I did not want to write a fictionalized memoir that would come off sounding like a rural version of the movie “Animal House.” In this I succeeded, at least according to reviewers. Shaun D. Mullen is an award-winning journalist and more recently an author. Over a long career with newspapers, this editor and reporter covered the Vietnam War, O.J. Simpson trials, Clinton impeachment circus and coming of Osama bin Laden, among many other big stories. His work was nominated for five Pulitzer Prizes. Mullen also mentored reporters who went on to be the best in the newspaper and television business, including several who won Pulitzer Prizes. He is the author of "The Bottom of the Fox: A True Story of Love, Devotion & Cold-Blooded Murder," a 2010 true-crime book about an unsolved murder in the Pennsylvania Poconos that recently has seen a surge in sales because of the manhunt for Eric Frein, who was captured after a 48-day manhunt and is charged with murdering a Pennsylvania state trooper. In August, he published "There's A House In The Land,” an historical fiction tale of the 1970s. Much of Mullen's work is archived in the Shaun D. Mullen Journalism Papers in Special Collections at the University of Delaware Library. I so loved this week, Michelle! How wonderful that he has rescued do many cats! Ps. Something went wrong when I tried to link up. The second link is the correct one. Maybe you can delete the first? I love reading about cats who have been rescued, what wonderful stories. I used a similar method when I introduced a second cat to my home; it worked well. What a wonderful treat to hear about his rescue cats! What sweet babies. Loved reading about those lucky cats!